This page is for the original 1998 release. 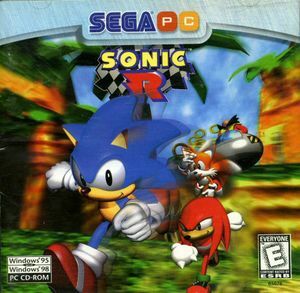 For the rare 2004 re-release, see Sonic R (2004). 1998 version is incompatible with modern versions of Windows without a considerable amount of undocumented work; use Sonic R Updater to update to the 2004 release. Some reprints are missing the music. Modified official network patch adds multiplayer over LAN and now working on modern systems. Network mode does not require a disc. 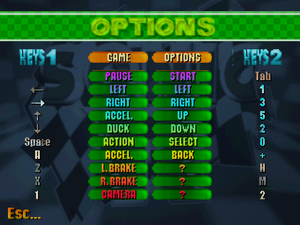 Upgrades the game to its rare 2004 re-release, fixes compatibility issues with modern Windows systems, removes the disc check, adds modding support thanks to Sonic R Mod Loader, custom resolutions and widescreen support, windowed/borderless fullscreen modes, and loading music from the installation folder instead of the disc. Network Mode is lost as a result of the 2004 re-release almost completely losing this feature. RemoveStrays - A fix for various graphical bugs tied to how the game maps textures for the UI. Sega Saturn Style Colors - A mod that fixes and restores vertex colors. This makes the game look more lively and colorful than it did before. Additionally it makes Radiant Emerald translucent like its Saturn counterpart. To get music back, go to Options/Sound and set Volume more than 1. 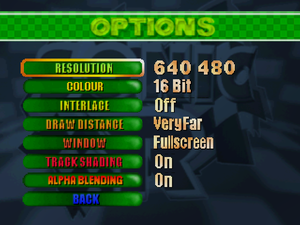 Install Sonic R Updater and adjust Sonic R Mod Manager's graphics settings for widescreen. Network menus cannot be navigated with a controller, but all other menus can. Some controller buttons can be configured however. Sound effect volume slider only. 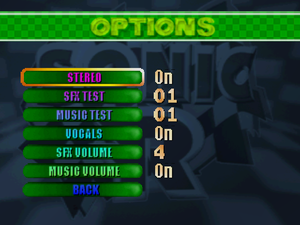 Sonic R Updater adds a music volume slider from the 2004 version. Local retail version only. Voices were translated. Use Sonic R Fixed EXE. Go to the installation folder and select sonicr.exe. Sonic R does not work correctly in DXWnd versions above 2.01.43. Patched the 1998 version with Sonic R Updater which allows for widescreen and custom resolutions thanks to Sonic R Mod Manager. This page was last edited on 13 April 2019, at 17:47.